The Turkish army imagined a military strategy like a Russian doll. The official purpose of the operations that have just begun is to fight the jihadists. In actual fact, the real purpose of leading these operations is to prevent the creation of new States, the Rojava and Kurdistan. 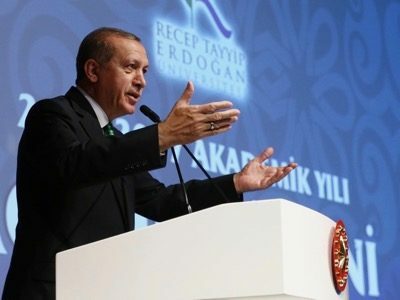 The operations are masking the possible implementation of the national oath of 1920 with the conquest of North East Greece, the entire Island of Cyprus, Northern Syria and Northern Iraq; the conquering of former territories publicly demanded by President Recep Tayyip Erdoğan. Following an agreement concluded between Russia and Turkey during the most recent Astana negotiations, the Turkish army entered the governorate of Idleb, violating Syrian sovereignty, in order to combat the jihadists there. the Syrian Turkmen which it had gathered under the flag of the former Free Syrian Army (FSA) and which it intends to use as a support in the region. Furthermore, the Turkish army already occupies Al-Bab, also violating Syrian sovereignty. The pipeline linking the pseudo Kurdistan to the port of Ceyhan (Turkey) will be closed by BOTAŞ, the Turkish public operator which owns it. Accordingly, the Barzanis’ oil revenues would be cut. Currently, Kurdish oil is chiefly exploited by the French company Total. It is sold in the European Union, Ukraine and Israel where it represents almost the entire domestic consumption. The border-posts between Turkey and Iran on the one side and the pseudo Kurdistan on the other, will all be closed, thereby cutting custom revenues of a potentially new State. So as to maintain Turkish-Iraqi trade relations, a new route will be open along the Syrian-Iraqi border permitting Ankara to be linked up to Bagdad. The Iraqi army will station 13,000 men to guarantee its security, whilst the construction works for a new pipeline along this route will begin at once. An ultimatum (by 1 November at the latest) will be addressed to the Barzani family preventing it from announcing independence. In case it refuses, the Turkish army is preparing to declare war against the pseudo-Kurdistan. It would make a two-pronged attack on Erbil, from the Turkish border on the one hand, and from the new route that has been secured by the Iraqi army, on the other hand. 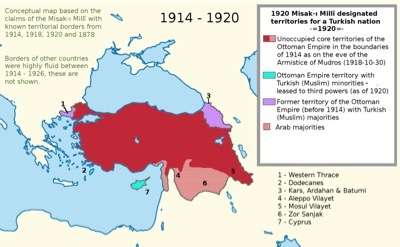 In 1920, Mustafa Kemal Atatürk, the founder of the Turkish Republic, drafts a national oath challenging the winners of the First World War and claiming the annexation of new territories for the Muslim populations whether they are in the majority or minority. In 1939, France only granted Hatay (Syria) to Turkey. Paris was also hoping that Ankara gets rid of its orthodox Christians which have their patriarchal base in Antioch.